Loic Remy has almost certainly kicked his last ball for Newcastle United after pulling out of their final Premier League fixture at Anfield. 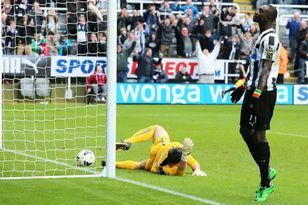 United want three strikers this summer after ditching Shola Ameobi and deciding to pass on signing Borussia Monchengladbach forward Luuk de Jong, but The Journal understands the chances of Remy joining Newcastle have receded drastically in the last few weeks. This is partly down to the player casting the net for more lucrative options with Champions League football on the table, but also a reflection of the player’s own attitude during the run-in. United’s top scorer was high on the club’s wish-list back in January but the player’s reticence to commit back then, along with opting to protect a slight injury in the final weeks of the season, have cooled the desire among United’s hierarchy to meet QPR’s £12million asking price. Remy, who was last night named in France’s World Cup squad alongside Magpies defender Mathieu Debuchy and midfielder Moussa Sissoko, played 10 times after Christmas and scored four times – as opposed to a hit-rate of 10 goals in 19 games before the festive period. There was a tacit admission from the manager that the striker may have had one eye on the World Cup when he said back in April: “The French manager needs to see them fit and ready before the World Cup.” It will come as a blow to Pardew, who has consistently stated his desire to move for Remy, but the club are determined to act quickly to snare their targets and believe that the France striker has already decided to play the market in the close season and favours a move to a club playing Champions League football. Newcastle held prolonged talks with Remy before striking a loan deal for him last summer because they wanted reassurances about his commitment to United and the club have now begun work on other targets – whom they hope to land before the start of the World Cup. Pardew spoke on Sunday about the importance of rediscovering momentum by recruiting well and bringing players in early. He added that Remy remained a target, although that was before a fresh round of talks with Mike Ashley and Lee Charnley, which have taken place over recent days. After the Liverpool reverse he said: “We are not completely resigned (to Remy not signing), we are working hard to keep him. “He’s been an important part of our season, and if you take him away, we will need to replace him for sure. We lost Yohan Cabaye in the Christmas period and that’s been difficult for us. Remy has made no secret of his desire to seek out a club playing European football next season, and his representatives are understood to have enquired with Arsenal and Tottenham Hotspur about their transfer wish-lists. “Clubs are currently discussing with my agent, I am open to everything,” Remy said back in April. Dan Gosling has been linked with a move to Bournemouth. He is included in a list of eight players who may be sold by Newcastle, who want to add at least six first team players to their squad in the coming weeks. The 24-year-old is one of a crop of players at the club who is out-of-contract and has not been handed a new deal. Shola Ameobi will also depart Newcastle. Meanwhile, Paul Dummett has had his claim of wrongful dismissal upheld after an Independent Regulatory Commission hearing. The 22-year-old defender was given a straight red card by referee Phil Dowd during United’s 2-1 defeat at Anfield. But Dummett will not have to serve a ban when the 2014-2015 Barclays Premier League season starts in August after the sending off was overturned yesterday.